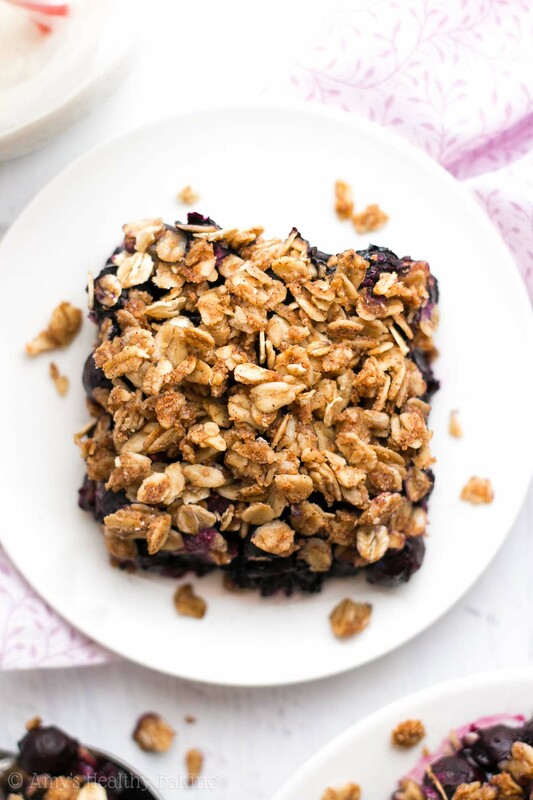 An easy recipe for homemade blueberry crumble. Juicy berries topped with sweet, crunchy streusel… What’s not to love?? And it’s secretly healthy enough for breakfast too! My mom perpetually stocks her fridge with fresh blueberries. 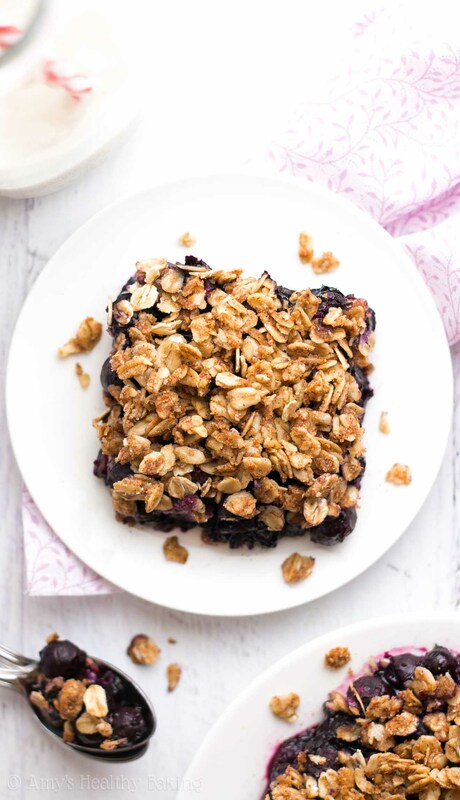 Many mornings, she pours herself a small bowl of cereal, usually something containing bran flakes and granola clusters with some slivered almonds as well, and she drops in a handful of those blueberries after pouring in her vanilla almond milk. Have you ever added fresh fruit to a bowl of cereal? 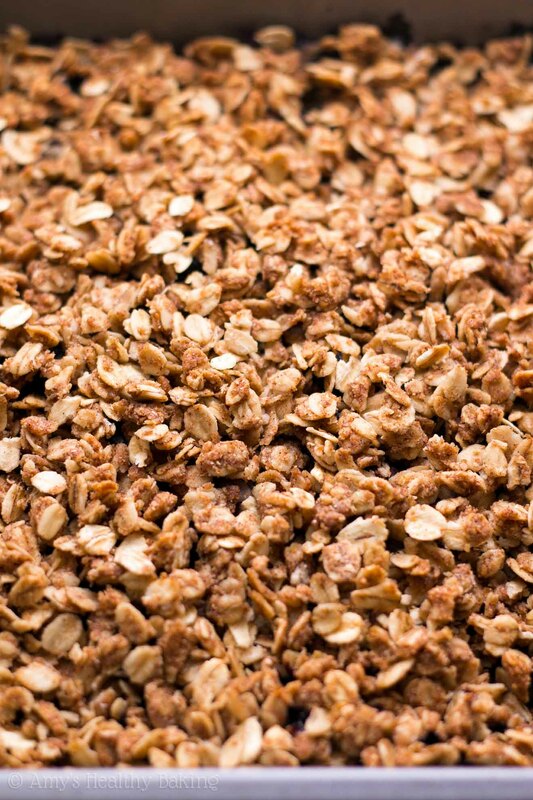 When you get a bite with everything—that soft, sweet, juicy burst paired with the slightly crisp flakes or crunchy granola clusters and the cold liquid from the milk—oh my yummm. It’s worth rolling out of bed for, every single time! When the temperatures started rising here in California earlier this month, Mom also began fixing herself one of her favorite summertime treats in the evenings with that same fruit: berries athenaeum. It’s one of the dessert options on the menu at the Athenaeum, a club-style restaurant owned by the college in southern California where she completed her undergraduate degree, and it’s very simple and straightforward. Add vanilla bean ice cream to a bowl, top with fresh berries, and, if desired, drizzle that with a little Grand Marnier and finish with a cookie, traditionally a classic hazelnut pirouline. Mom generally sticks to the ice cream and berries… And after bringing a coworker to the Athenaeum a few years ago for dinner during one of their business trips to the college, that sweet lady started making berries athenaeum at home too! So when I gave Mom and Dad this Ultimate Healthy Blueberry Crumble last Friday, she topped her first slice with vanilla ice cream, just like with her favorite easy dessert. And by the end of the weekend, every last crumb had disappeared from the pan! But since the crumble contained no refined flour or sugar… And a full serving of fruit in every slice… And just 127 calories… My parents didn’t feel guilty about that at all! To make this healthy crumble, you’ll start with the topping. It’s super simple! 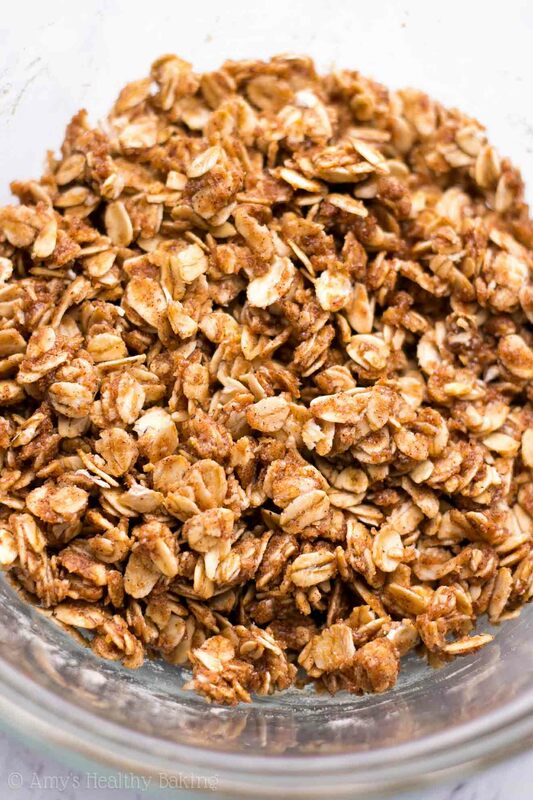 Just whole wheat flour, old-fashioned oats, and cinnamon held together with a little sweetener and melted butter. Yes, melted butter! Traditional recipes require you to cut cold, cubed butter into that mixture, but… That takes more effort. (And makes my muslces tired, especially if I already finished an arm workout earlier in the day! ?) It’s much easier to stir in melted butter, so we’re doing that instead! As for the sweetener, you’ll use pure maple syrup instead of granulated or brown sugar. Be sure to use the good stuff! Avoid pancake syrup or sugar-free syrup; those contain corn syrup or artificial ingredients, which we’re avoiding in this healthier recipe. The only ingredient on the label should be “pure maple syrup.” It’s generally sold in thin glass bottles or squat plastic jugs, and I’ve also bought it online. Because the blueberries release lots of juice while baking, you’ll mix them with cornstarch before adding them to the pan. The cornstarch thickens those juices, especially while the crumble cools, so it’s very important to let the crumble cool completely to room temperature before serving so the cornstarch can do its thing. If you prefer eating your crumble warm, I still highly recommend letting it cool completely, then reheating individual portions! Pure bliss. And when you bake this, remember to snap a picture and share it on Instagram using #amyshealthybaking and tagging @amyshealthybaking IN the photo itself! (That guarantees that I’ll see the notification from you! ?) 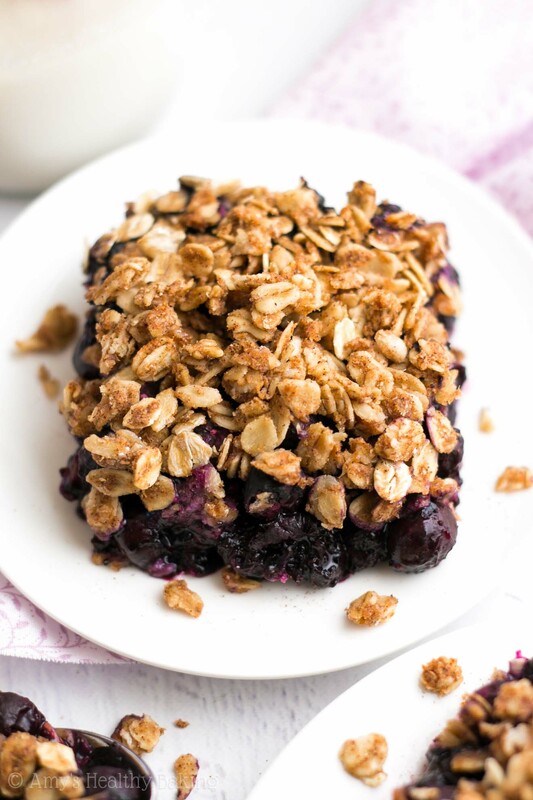 I’d love to see your blueberry crumble and feature it in my Sunday Spotlight series! Transfer the filling to the prepared pan, and sprinkle evenly with the topping. (The topping tends to clump, so try to break it up into fairly small pieces.) Bake at 350°F for 45-55 minutes or until the juice is bubbling at the sides of the pan. Cool completely to room temperature; then refrigerate for at least 3 hours before serving to allow the juices to fully thicken. Notes: To make the crumble gluten-free, use the millet flour option and certified gluten-free oats. Almost any other gluten-free flour will work as well, except for coconut flour. Do not substitute coconut flour. For a vegan version, substitute Earth Balance buttery sticks for the best results. Coconut oil will also work, but the flavor and texture of the topping will be slightly different. Both fresh and frozen blueberries will work. 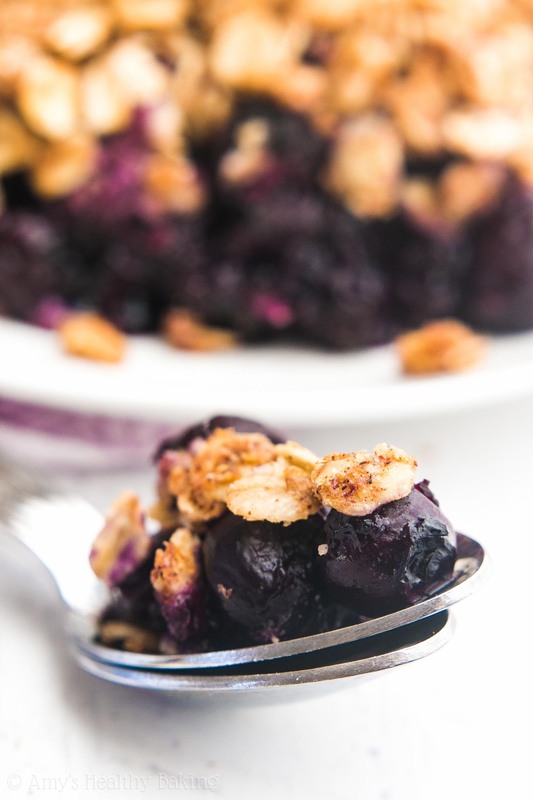 If using fresh, then add 3 tablespoons of water to the blueberry filling, just before adding the cornstarch. If using frozen, do not thaw them. 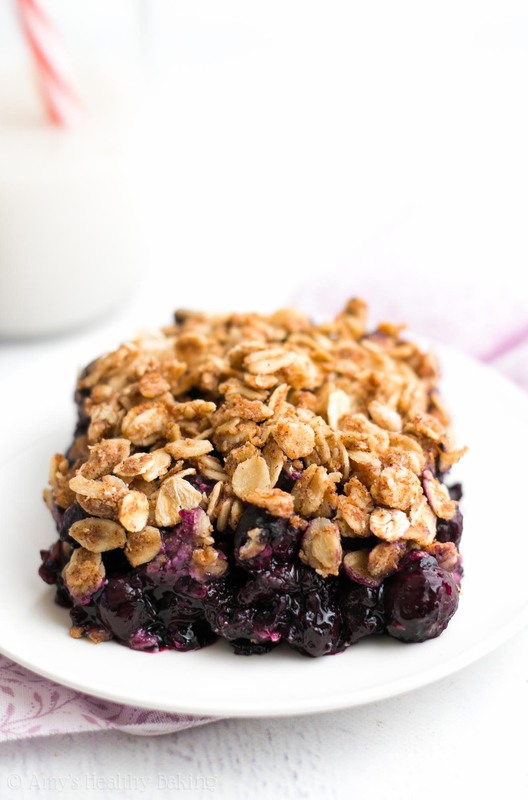 Toss the frozen blueberries directly with the cornstarch, and bake the crumble for closer to 55-65 minutes instead. If you prefer to enjoy your crumble warm, then reheat individual portions once it has chilled in the refrigerator. Hi Amy! This looks sooo delicious! Could you use arrowroot starch in place of the cornstarch? Hey Amy! The crumble was DELICIOUS and such a hit at our dinner party! I did use arrowroot starch in place of the cornstarch, and also used almond flour instead of whole wheat flour. It turned out perfectly! I can’t wait to make it again ? I’m so glad you loved this crumble Camille! I’m truly honored that you made it for your dinner party, and that’s the best compliment ever if you can’t wait to make it again! 😉 Thank you so much for sharing that with me!! This is an awesome recipe! I took it to our “Berry” Sunday at church and anyone who tried it loved it! I’m taking it to my small group this week too. I used honey because that’s what we had in the house, and Earth Balance Original in a tub because our local store didn’t have the sticks and for my flour I used a brown rice flour. Everything turned out great and tasty! If you don’t mind I”ll be doing a post about it’s yummy goodness in my blog Mom’s Herbs and Oils (www.momsherbsandoils.com) later this week. I’ll make sure I link back here and tag you on Instagram. Thanks for the recipe! That’s correct. The post will be mostly about the health benefits of Blueberries and I will link back to your post. Hi Amy I was in Northern Ontario we had fresh blueberry I asked my sister to google a healthy blueberry recipe and she found your recipe. Everybody love this recipe, so Than you so much . Just made this! It looks beautiful in my red deep dish ceramic pie dish. I added some lemon zest and lemon juice to the berries, and chopped Pena’s to the topping, and used honey rather than maple syrup because it’s what was on hand. Turned out lovely. Thank you. I am still in the baking process but had a few adjustments that needed to be made. 6 C. was too much berries so I did 4 C. instead. There was not enough crumble so I had to double that. I also added cardamom and salt to the topping. Seems like it will be a real winner! Turned out lovely. I will definitely be making it again. Wow how the flavors of the fruit come out when they aren’t overpowered by so much sugar. Thanks for this recipe! Yum yum. This was super tasty! I used agave instead of maple syrup, and squeezed some lemon juice before tossing the berries. I took it to a dinner party, where my friends raved that it made them want to curl up with a cup of coffee and have it for breakfast 🙂 Thank you! I’m so glad everyone enjoyed this crumble Celina! I’m truly honored that you’d make one of my recipes for your dinner party. That means the world to me! 🙂 Thank you for sharing the kind words from your friends too! !